Never buy batteries or bulbs again!! 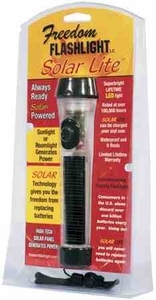 Introducing, the Freedom Flashlight LC Solar Lite�! With environmentally-friendly, patented, innovative solar-powered technology that gives you "freedom" from using or replacing batteries! No need for replacement batteries. It floats and even operates under water!!! Is easy to store and always ready for use. High-tech solar panels generate power from sunlight or room light.